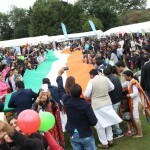 High Commission of India, Telangana NRI forum –TeNF UK, and Indian community organisations celebrated 70 years of India’s Independence by way of a grand fair at Indian Gymkhana Club grounds in London on September 10, 2017. 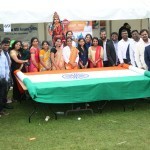 TeNF as an organisation have been working on a yearlong program promoting telegnana weavers across UK sourcing directly from the handloom weavers families .As a goodwill gesture the weavers of Sircilla town of Telangana state which is famous for hand woven fabrics ,with great patriotism have woven a giant Indian national flag . This flag is the biggest Indian flag ever unveiled outside India. (woven according to the code of the national flag ) TeNF had the honour of presenting a very special memento on behalf of Telangana weavers, the national flag spanning 51.2 meters (167.11 ft) with a width of 1.3 meters (4.3ft) .The flag was unveiled by Hon.High Commissioner Y.K Sinha along with thousands of individuals present . 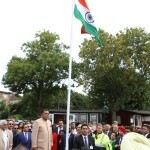 Thousands of Indian community members converged from all parts of UK to make this day a great success. 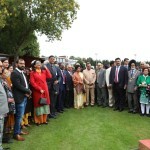 Community organisations put up nearly 80 stalls offering various regions cuisines of India and put up a rich display of cultural programmes showcasing the cultural heritage of India. 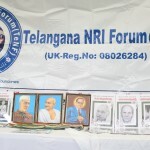 TeNF in its third consecutive year represented Telengana state, and this year with a new spirit and enthusiasm set up a stall to promote telengana, its culture and traditions. 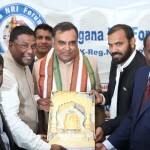 Indian origin British MPs Virendra Sharma, Seema Malhotra, A.s.Rajan (HCI minister coordinator),other local mps visited the stall and appreciated the efforts of TeNF and the way we marketing new state of Telangana to the world. Our authentic Telangana food – Hyderabadi Biryani has been served to all the guests who visited our stall, which was widely appreciated by everyone. Team TeNF founder gampa venu, President Ceeka Chandra Shekar Goud, Advisory head Pramod Anthati ,vice-president Goli Tirupati, Gen secretary Sudhakar Rangula ,Nagesh Reddy Kasarla ,Treasures Naresh mariyala and Venkat rangu ,Joint secretaries Bhasker pittla and suresh gopati, Sports incharge pittla elendar, Sponsor in charge bhasker motta, ashok medishetty, executive members Sridhar neela, ,veeru chowdary ,Satish vasireddy ,Santosh akula Women cell members Meenakshi Anthati,Joythi Kasarla ,Preethi nomula ,Sirisha Chowdary , Kavita Goli ,vani ansoori , ramadevi,rajitha neela, were among those TeNF – board members and guests attended the event.